This piece was interesting in that it was fairly rushed. It was the final work for the 2013 Luton Hoo walled garden exhibition, to be submitted alongside 4 other pieces:- “View from the Deck”, “The Garden and Beyond”, “The Empty Birdfeeder” and “We fade to white”. I had planned to work up some final sharpening detail work on the round ‘seed heads’ at the front. Unfortunately, I got involved in “We fade to white” on handing in day and only managed 5 minutes on this piece. Ironically this one was accepted while “We fade to white” wasn’t. I had at the back of my mind that sections in focus at the front was enough and areas less defined would perhaps suggest movement and life. 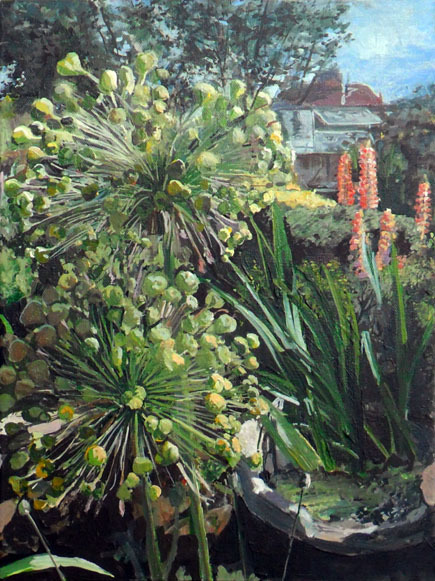 The piece is almost a detail of the painting “The Garden and Beyond”, in as much as the foreground double headed plant can also been seen in the bottom right hand corner of that piece – the water and the greenhouse are also present in both. The angle of view is quite different however. This reminds me of Ridley Scott’s film “Blade Runner”, where a photo is enlarged and investigated by scanning around corners within the photo. Frankly this is the only connection to that film in this work – but weirdly this “not really a detail” detail tickles me for some reason. Perhaps I’ll add a Unicorn in the background at some later date. As with all these images from that summer party photo session, I was particularly keen on how the sunshine catches the plants. It really does bring life to proceedings. I hope that you agree.